Over the last few months I've been thinking a lot about the type of life I want to live. What type of person do I want to be? What will help bring about contentment? Values give you a sense of purpose. They reflect who you are on a daily basis, in everything you do at home and at work. More often than not, I see values getting pushed aside and compromised. It's time that we change that. It's time to bring back the values that matter in life. By doing so, you'll discover that you have been purposed to flourish, shine, and prosper. These values can be found throughout the Bible. It's the instruction book to life. Nora Conrad wrote a great piece on becoming a Proverbs 31 woman, and I highlighted a few of her points in this list. Practice these essential values everyday to build a cornerstone to happiness and begin living a calmer, more well-rounded life. Love as God first loved us. True love is selfless; it puts other's needs before our own. Have the character to what's best. Even if no one is watching. Gratitude changes everything. Practicing gratitude helps you realize that there is so much in your life to be thankful for. Humility should be one of the most celebrated virtues of our culture. We should cultivate a healthy perspective of how minimal our contribution is to the scheme of things. Employing a natural sense of humor is always appreciated. Sought and gained through experience and hardship, to obtain its full worth, wisdom must be given away to other. Rest in a place of dignity and hold yourself a standard always cherished. A virtue that will never go out of style, true honesty keeps your heart pure and your mind free of doubt. When your life, faith, or foundation is shaky, staying devoted emphasizes that it's important to you. Let your heart be moved to help those who need it. Effectiveness, simplicity, and refinement exhibit a sense of dignity. Carry yourself with simple elegance, behave politely, and have the disposition to be generous. Uphold yourself to morals that can not be compromised. You'll discover clarity in your life by focusing on things that truly matter. Rather than showing contempt, tolerance shows respect, patience and courtesy – all important values in their own right. In our journey through life, putting others before ourselves allows us to gain perspective of what really matters. Self discipline is a learned behavior. Instead of letting choices be dictated by impulses or feelings, make informed, rational decisions on a daily basis. Maximize performance by practicing regularly over time. Keep going, even if it gets really hard. Remember, you are capable and worthy of anything, but be humble enough to keep yourself from being arrogant. Sometimes you'll see the glass as half empty, and that's totally fine, but remember that the half empty glass has the potential to become half full. Be genuine and real with your words and actions. Say and do things from the bottom of your heart. Encompass the skills of welcoming friends, family, and strangers to claim the joy of homecoming. Eliminate unnecessary clutter from your life–toxic friends, unused items, or one of the many things you've said yes to–and find that life is more fun when you have your favorite things to focus on. Smile at strangers, give hugs freely, and be the first to say hello. Exhibiting warmth will let happiness bloom in others. When you experience peace, you create a space for happiness, love, and light to shine on in. Instant living gives way to impatience. Practicing patience provides a great feeling of inner balance and strength. By being intentional about applying kindness towards your actions you can truly change the world. Be good to those around around you by cherishing and loving them. Earning the trust of others will enrich your life and the people around you as well. Speak with a gentle tongue, as harsh words stir up anger. Be quick to forgive and walk in patience, kindness, and grace from day to day. Be honorable, dependable, trustworthy and great opportunities will come your way. Wisdom and honor don't come to those who are lazy. One must be willing to work harder than they ever had before. Care for others; provide for their needs before your own. She gets up before dawn to prepare breakfast for her household and plan the day’s work for her servant girls. Proverbs 31:15 God never intended for use to sleep half of the daylight hours away. Use your time wisely. A restful night's sleep will leave you refreshed for a full day ahead. Work hard. Learn all that you can about how to deal with other people in a professional setting. Fuel your body with whole, natural foods, antioxidants, and exercise rather than consuming energy drinks. Your energy and happiness will last so much longer. Life gets hard; really hard. But if you can rough it out, you'll come back stronger than ever. Courage is life's blood that fuels us. Constantly display it by trying new things, being unique, or tackling a fear. When you practice the art of gratitude, you'll begin to see how wonderful it is to give to others less fortunate. To entail a perceived quality of worthiness and respectability is true honor. Speak with respect to others and never degrade another being. Keeping an open mind allows a fresh perspective to enter. Having the latest and greatest and most expensive things doesn't necessarily mean you're the happiest. Never lose your sense of wonder, no matter what age you are. You have been given hands with the potential to create beauty out of the unlikely. You bring unique talents to the world. Rather than trying to be something or someone that you are not, just be yourself. Improving your health gives you the energy you need to do the things you love with the people you cherish. What other values would you add to the list? How will you practice these values in your own life? As I write this, it's 7:22 p.m. I'm on winter break. I'm supposed to be finishing up my scheduled blog post. I'm supposed to be having amazing weekend adventures with my best friends. Instead, all I can think about is a girl I've never met. Three days ago, a girl from our sister college, Walla Walla University in Washington, was hit by a truck while riding her bike near campus. She was airlifted to a hospital in Seattle with numerous severe injuries. News of the accident spread rapidly through social media, and people from around the world began to lift her, her friends, and her family up in prayer. But a day later, Madison (Maddy) Jewel Baird passed away. She was 20 years old. When the news of her accident spread to our campus that Tuesday evening, we all gathered together to pray. Even though Walla Walla is states away, you'd be surprised at how interconnected the Seventh-Day Adventist (my religious denomination) community is. I have friends from Washington that knew Maddy, one of which is my roommate; she and Maddy worked together at a camp in Oregon in the summer. Now, a day after Maddy's passing, my Facebook feed is filled with videos, pictures, and memories of her. Just by reading these posts, I can tell that she had a warm, happy vibe about her that affected everyone she met. She'll be greatly missed. But why do I care? I didn't even know who she was before. Well, I care because it could happen to me, it could happen to you, it could happen to anyone. Your life could change in the blink of an eye. We live in such a fast-paced, materialistic world that we don't even take enough time to marvel at the beauty of nature and simple things in life. A home A structure, a building, a cage, A piece of dirt that outstretches from within the earth; We put a price tag on it. We build upon the land and call it ours The mountains, the valleys, the ground It is more than money can ever offer. its not just a structure, it’s our home In the midst of building the world up The earth sits waiting and rejected God’s canvas is put on sale. The worlds beauty sits among the ruins. The rainforests cry out. The ground shakes out of anger Yet, will anyone here their plea. Let us not forget the beauty of the earth, Do not forget. 1. Get outside and experience God's creation. 2. Eat healthy. Your body is a temple of God. 4. Never underestimate the power of a simple smile and "Hello!" 5. Beauty is often overlooked when it becomes part of a routine. 6. Sometimes the best things are the simplest things. 7. Breathe in the beauty of a new day. So even though I never met her, the legacy that she left behind causes me to look up and remember why I'm here on earth. Let's rediscover the beauty of God's creation. Let's cherish the little moments that make life so meaningful. To get the complete story about Madison Baird, please visit here. For more information on what Adventists believe, visit this website. It's time for another Community Brew post today, hosted by Madison of The Wetherills Say I Do and Rachel of Oh Simple Thoughts! This month's topic is all about generosity. Just like last month, I know that I'm a day late posting this due to my crazy finals schedule these past few days, but I'm super excited for this month's topic, which I think is especially fitting for this time of year. Christmas time is a very busy time. All the preparing and running around can make you feel more stressed than relaxed. Still, every year, I see something different in the way people act this time of year. They're more generous. Now I'm not saying that people are selfish during the other three seasons, but I see all this gift giving making a positive impact on people's lives. Yesterday morning was my last final for the semester (yay!). Turns out, I didn't completely study all the right material and my confidence on the test was shattered as I looked at the first page of the test. Needless to say, the test didn't go over as well as I had hoped. A little depressed, I went to the campus bookstore to return my rented books (a.k.a. get rid of the book for that class) and pick up a package that had arrived earlier in the week. When I went back to my room to open it, I discovered that it was from my "secret elf" Charlene of the Great Christmas Exchange! Excitedly I opened the box and smiled from ear to ear when I discovered what she had chosen for me: a beautiful mug from Crystal Faye with my blog name on it, a Kate Spade notepad, a box of green tea, and a sweet Christmas card. I'll be showing photos of these amazing gifts later in the month, don't worry. Back to the story. I nearly cried of happiness because of the thoughtfulness she had put into the gifts. She discovered what I liked and tailored it to fit me. Her generosity truly made my day! Someone else gave an amazing gift of generosity over 2000 years ago. God gave us his only son to die for us, the ugly sinners. We weren't deserving of that, but did that matter to God? No. He did it out of his love for us. That's what generosity is. It's selfless giving, modeled after the great gift we were given from God. Buy someone a meal: at the cafe, restaurant, or the person behind you in the drive through. What are your thoughts on generosity? I am so excited to bring you another Community Brew post today, hosted by Madison of The Wetherills Say I Do and Rachel of Oh Simple Thoughts! This month's topic is all about Seasons. I know that I'm a day late posting this due to my crazy busy schedule these past two days. Nevertheless, I always look forward to these posts because I get to share from my heart. Esther 4:14 || Isaiah 40:31 What has God taught you about seasons in life? How have you learned to move from one season to another? What is your current season in life and how are you learning to grow in that season? When I think of seasons, I think changes in life; changes that may sometimes push you out of your comfort zone or changes that you eagerly accept. I absolutely love what Madison had to say on chasing seasons. As a person who loves dreaming about the future and what's in store, I find that I have to learn to slow down and cherish the season I'm currently in. I have so many dreams I want to fulfill, such as graduating college with a double major in only four years, getting married, decorating a house, starting a business, growing my blog, the list goes on and on. As much as I want to be in control of the path of my life, that is completely out of my hands and in God's only. What I've learned over the past few months is that God has His own timing, and things don't always go the way you thought they would. You may stay in one season longer than another, or you may change between multiple ones in a short amount of time. But if you're constantly wanting to get to the next season, you'll never fully enjoy what's happening in the moment or learn what God is trying to teach you. Right now, I really want to move on to the next season in my life, but I can hear God saying "Not yet", because I have some things to learn. Things like patience, priorities, and not being wasteful. So if I had to choose one word to describe the season I'm in currently, it'd be growth. I'm learning to be a leader, learning to work with people, learning to apply things in life. I'm growing in my spiritual life day by day and growing in knowledge as I go to classes and study every night. Yet the one thing this season has really taught me is patience. It's not all about me and what I want. Just because something doesn't go the way I wanted it to doesn't mean it's ruined. That's being selfish. God's using this season of growth and learning to mold me. So take time to reflect on what season you're in. Don't try to rush God's timing. Seasons in life will come and go, but your memories of those seasons will stay with you forever. What do seasons mean to you? What season are you in? I decided to start with a fun item that would be the central gift of the box. Boys LOVE balls, especially soccer balls. I want him to open the box and find a gift that he can immediately enjoy and have fun with. To get the ball to fit in the box, I had to deflate it, so I included a pump so he can actually use the ball. This is a useful gift that is still really cool. Instead of getting a regular old flashlight and sending over some batteries, I bought him a hand powered one. It's super bright and all it needs is a few cranks and it's good to go! It even comes with a carabiner clip, so he can have it with him everywhere he goes. This travel sized kit include a toothbrush, toothpaste, shaving cream, razor, deodorant, mouthwash, and a plastic reusable pouch. I took out the shaving cream because it was in a can that might explode, and I bought an extra tube of toothpaste because the small tube won't last very long. I packed all of this into a clear, plastic bin with latching handles. A plastic bin is so useful, and he can use for other things once he's taken his gifts out of it! Packing a box was so much fun, and I can't wait to do it again next year! I hope to volunteer in the distribution center again too, just like I did in high school. I love seeing all the shoeboxes getting ready to be shipped off to the welcoming arms of boys and girls. If you packed a box this year, I encourage you to link up with Haley of A Beautiful Exchange and join in on the #OCCBlogShare fun! What gender/age group do you like to pack for? Have you ever volunteered at the distribution center? P.S. Today is me and Caleb's 3 year dating anniversary!! :D Take a look at some of our couple's photos a friend of mine took! Happy Friday everyone! :) I don't know about you, but when the time changed last Sunday all I can think about now is how close we are to the holidays! Thanksgiving, Christmas, friends, family, food, giving, happiness, sparkle, smiles - it all makes me so happy! I can feel the joy in the air, and I just want to spread that joy and love to everyone. So, today I am really excited to share about something that I love to do to spread joy during the holiday season to those who may not otherwise experience it. A few weeks back, Hayley from A Beautiful Exchange invited a bunch of bloggers to participate in an Operation Christmas Child linkup. Operation Christmas Child (OCC) is a charity project sponsored by Samaritan's Purse. Every year, thousands of people pack up a simple shoe box (or plastic box) and fill it with gifts that are gender and age appropriate. When packing your box, you can choose whether you'd like to send it to a girl or boy, and pick an age group (2-4, 5-9, or 10-14 years old). Once you pack your box, you can drop it off at your nearest drop-off location and from there, the gifts are distributed to children that wouldn't have had the chance to receive a gift for Christmas! But even if you don't have time to shop for and pack a box, you can still share God's love to these children! Operation Christmas Child has this neat opportunity to build a shoebox online! You can select items from a list of gifts and even add a personal letter and photo. Your "virtual" shoebox will then become a real shoebox, as Samaritan's Purse will pack it and ship it for you! How cool is that? If this is your first time participating and you don't know where to start, Hayley has made a wonderful document with everything you need to know! Participating in OCC is an amazing experience. Caleb and I are super excited to go shopping for items to include in our box this weekend! Next Friday I'll be sharing what we included and show a little more of my packing process. I encourage you to join us using the hashtag #OCCBlogShare and linking up your packing process post next week! Join us as we share God's love and change lives through the power of a simple gift. Have you ever participated in Operation Christmas Child before? P.S. Have you ever heard of Project Impact? 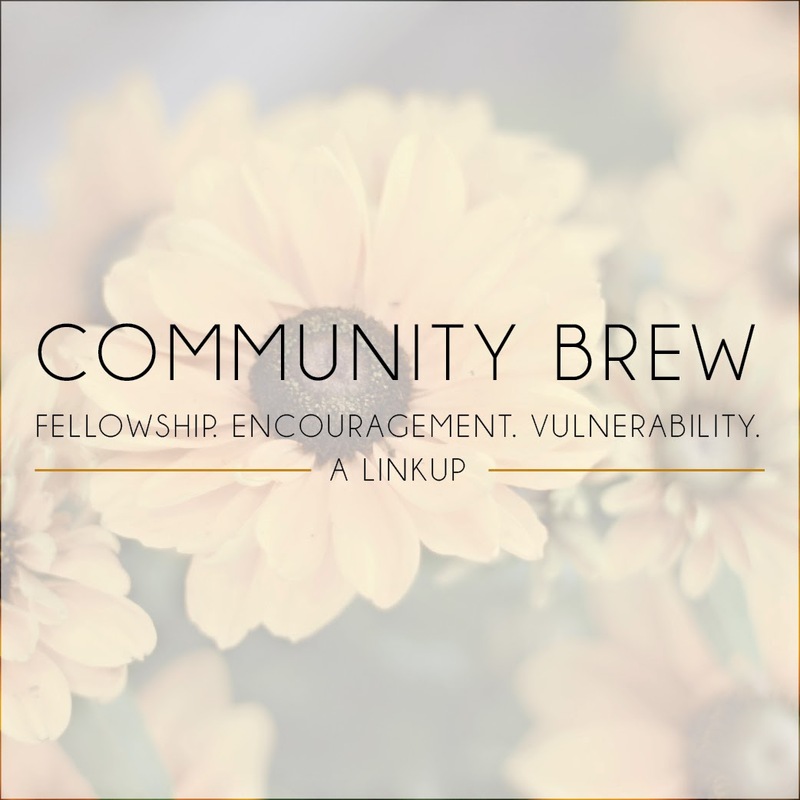 Today is my first post as part of a linkup called Community Brew. Two of my favorite bloggers, Rachel of Oh Simple Thoughts, and Madison of The Wetherills Say I Do, began this linkup to give bloggers the opportunity to open up, be honest, vulnerable, and build community with others. Sometimes the prompts are on marriage, sometimes they are about life in general, but today's topic is on gratitude. I'm really excited to talk about this topic because its something that has been on my heart lately. Earlier this month I shared my September Goals, and one of the things on my list is to begin a gratitude journal. Honestly, I've be slacking on that. Life has been a whirlwind these past few weeks. I feel like I've been barely able to keep up with everything. Between work, classes, friends, homework, hobbies, meetings, and projects, I don't have much time to relax. It's so true. I took a moment to be by myself and sat outside earlier today. I spent the time in conversation with God, not complaining about how busy I am (although I did ask for peace, guidance, and the strength to complete things efficiently), but being thankful for all that He's done for me. I felt so much more alert and prepared the rest of the day. My outlook on things had changed; I was more positive. How little time we spend being grateful for what we're blessed with. We let life bog us down and take our focus away from what truly matters. My personal verse to remind me to take time to be thankful is Colossians 3:15-17. I'm excited to share that I will be using my gratitude journal beginning today! I want to be more intentional on taking time to be grateful. The crisp air of early fall mornings. The chance to get a good education. Conversation dates with my girl friends. A warm bed to fall into every night. The sunlight that streams through the trees. Laughter that brings me to tears. What are some things you are thankful for? How do you show gratitude even when you feel burnt out?